25 May 2015 / 17:20 H.
Giant rat caught during Subang Jaya 'Ops Tikus'. PETALING JAYA: A photograph of a gigantic rat, allegedly caught during an operation in USJ11, is now making rapid rounds on the the social media. However, there is nothing to get worked up about as this is not a species of some mutated rodent, but merely the result of the angle the photograph was taken. 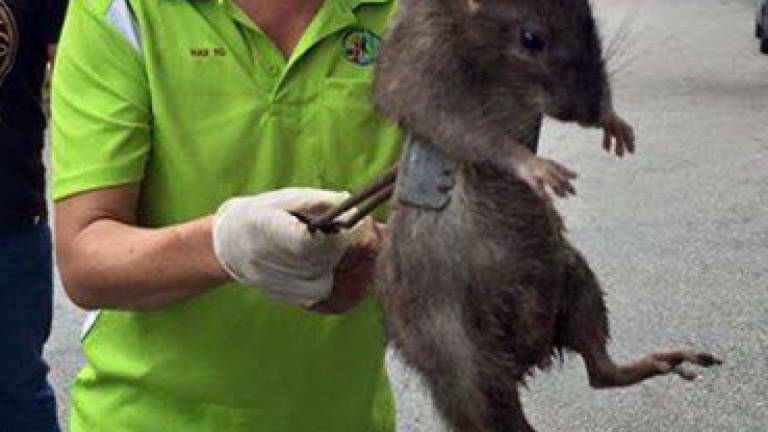 According to Subang Jaya State Assemblywoman, Hannah Yeoh, the rat was caught during an "Operasi Tikus" by the Subang Jaya Municipal Council and residents of Zone 3. Yeoh later posted the original photograph which shows the rodent's actual size on her Facebook.